Welcome to The Hall of Blue Illumination, a podcast dedicated to the world of M.A.R. Barker’s Tékumel. Scott has recently started an Empire of the Petal Throne game, so in this episode we discuss some of the more abstruse aspects of the 1975 rules set. Our hosts close out the episode with pronunciations of the names of the Five Gods of Stability. [00:01:20] In Scott’s youth, he believed the 1975 rules set inferior to more modern rule systems. But now he now realizes that EPT is a wonderful game as written. [00:16:20] Unless you’ve picked up the original playtest rules, you won’t know that Comeliness wasn’t an original EPT statistic. This provides a window into Professor Barker’s approach to roleplaying. [00:20:09] Real world analogs to Tsolyáni foods, tsi’il, hmá, and hmélu. [00:20:52] In a “fresh off the boat” campaign, how do you reconcile the civilized Tsolyáni skills in § 420 with foreign player characters? [00:27:16] EPT’s skill system predicts the non-weapon proficiencies of Advanced Dungeons and Dragons. [00:28:06] The chance of succeeding at a skill is determined by rolling on the Chances of Spells Working Table (EPT § 434, p. 21). [00:29:10] James reveals one of his house rules: occasionally, he transposes high Basic Talent scores to the Psychic Ability Chart (EPT § 414, p. 17) and where this chart gives bonuses to spells working, adds that to appropriate skill rolls. [00:39:07] Swords & Glory and Gardásiyal are more granular systems. [00:42:22] Pronunciation guide for the names of the Tlomitlányal (the Five “Gods” of Stability). [00:47:25] The pronunciation of kh in the languages of the Five Empires. 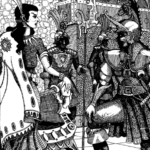 The original manuscript of Empire of the Petal Throne is available as a PDF from RPGNow. The original Chainmail rules were published by Gary Gygax and Jeff Perren in 1971. They are available as a PDF from RPGNow. The Advanced Dungeons and Dragons 1st Edition Dungeon Master’s Guide is available as a PDF from RPGNow. The “From the Sorcerer’s Scroll” article Victor referenced appears in The Dragon #24 (April 1979). It was reprinted in The Best of Dragon Magazine, Vol. 2 (1981). A very enjoyable discussion. Like most EPT GMs I’ve pored over the definition of “Hit Dice” and made my own decisions. The main confusion comes, I think, not from familiarity with how D&D does things, but with the rather unhelpful definition in section 700. Taken alongside the character generation rules it seriously muddies the waters over what precisely references to Hit Dice mean. Thank you for your comment, Jon. There are certainly a few muddy sections of the 1975 rules and hopefully we’re able to clarify a few things on the show. I’m glad that you enjoy the podcast!